Best-Laid Plans… and Messy Studio Tables! My plans last month were: Travel to help oldest (daughter) get set up her brand new third-grade classroom, return home, travel with hubby to get youngest (son) settled in to his second year of college, return home, and work like a crazy person in my downtown studio, creating at a record pace to fill my Etsy shop and my local display at Fordham Market for the busy fall season. Reality was: The very night of the college move-in, what I thought was an annoying pulled muscle in the back of my shoulder (that I’d ignored for weeks) suddenly morphed into something excruciating. Pain not only engulfed my shoulder, but my entire arm and hand as well. So began my adventure with entrapped nerves – the ones that exit the vertebrae in the neck and pass through the Scalene muscles (the three muscles in the side of the neck). I am beyond thankful to have found a neuromuscular massage therapist with a masters in physical therapy. (Think part relief/part torture.) She is slowly putting me to rights, but it’s a long healing process. Still don’t have complete feeling in my last two fingers or full strength in my right hand; still packing myself in ice several times a day to chill in the recliner we ended up buying. (This condition does not lend itself to much actual sleep!) Note to my artist and writer friends: years of hunching over drawing tables and keyboards contributes to the possibility of this! So, take frequent breaks. Watch that posture. Breathe. Anyway, my therapist recently “allowed” me to work an hour in the morning and an hour in the afternoon, if I rest with ice in between. 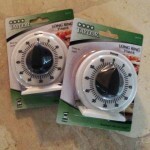 She even made my buy two timers – one for the studio, one for the computer. I’ve been SO happy to be able to make some art, and make a mess, even if it’s for short periods! Just so happens I was trying out a technique I’d recently seen in a video by the talented and generous Seth Apter. 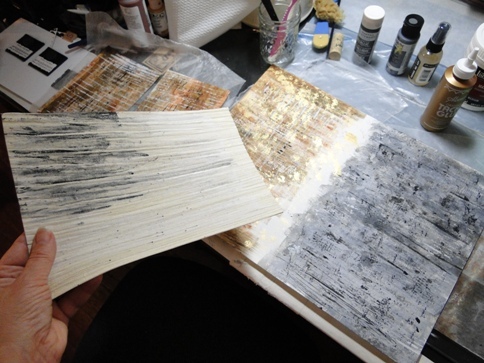 He had demonstrated a way to use textured wallpaper samples and gesso when working on mixed media surfaces. This necessitated, of course, that I find a really cool book of Italian wallpaper samples on eBay and purchase it. Yes, I did. I’d been trying out this technique the last couple of days in my brief studio visits. Then late today I stumbled on a Twitter link to a fun round-up Seth is doing on his blog, The Altered Page. 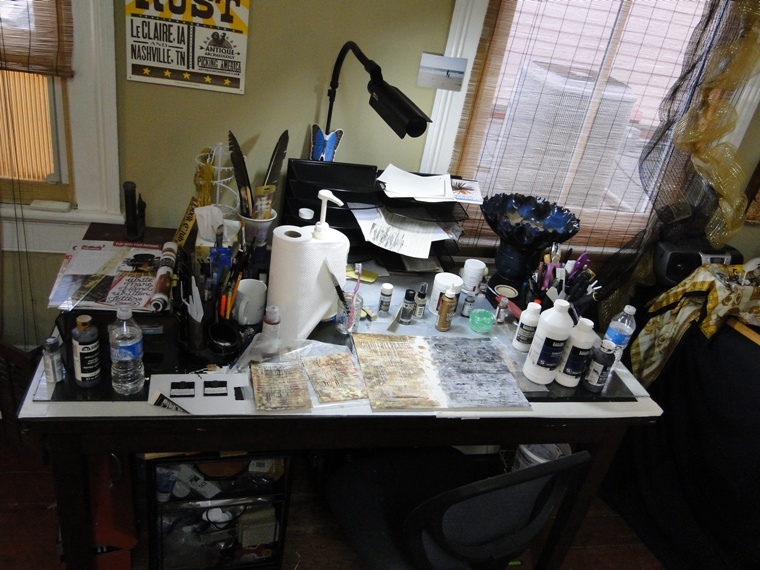 He’s invited artists to submit links to their own blog posts featuring their messy studio tables! Kind of a come-as-you-are-party, rather than the polished and perfect studio pictures we all drool over in magazines. 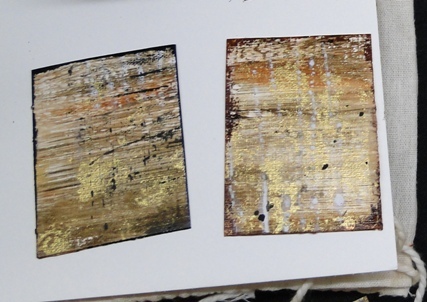 working on mixed media substrates, with the help of some Italian wallpaper…! 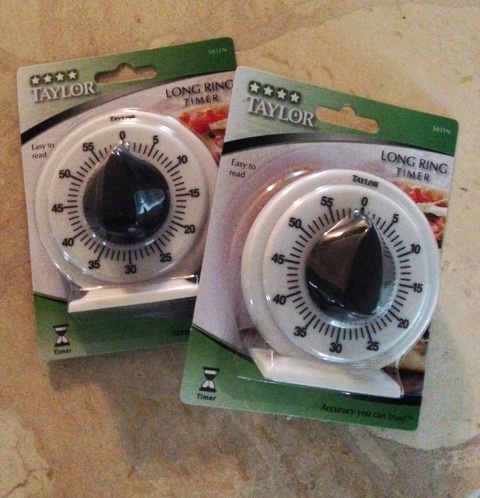 I have plans for these…. and I can’t wait to spend LOTS of time in here, making more messes! If you love sneak peeks into working studios, be sure to check out all the great links artists have submitted to The Altered Page. That will keep me busy in my recliner for quite a while. And if you’d like to see more of my own studio, I posted a little “tour” a few weeks ago, here. Thanks for coming by! This entry was posted in Uncategorized and tagged art, collage, mixed media, ponderings, Seth Apter, studio tips, studios, The Altered Page by artsyletters. Bookmark the permalink. Great table space – who doesn’t love gesso? An indispensable product! Thanks for sharing your creative space. Hi, Terrie – Welcome, and thanks for visiting! Where would we be without gesso? Oh Robyn, I’m so sorry to hear about your nerve/muscle thing. You poor thing. It sounds excruciating. 🙁 Is it something that will heal completely? It’s a good reminder to take frequent breaks alright. I know if I don’t do my yoga on a regular basis, I get very stiff and sore, especially in my neck and upper back area. Gisele! So great to see you here. :0) I think of you often. Glad to hear you are taking care of yourself. I should heal fine, but it evidently takes forever. I’ll also have to heed my own advice and regularly stretch, watch posture, etc. etc. :0! You know, this move over the past year involved countless solo trips (about 6 hours each way) with my schlepping way too many boxes, furniture items, etc. while hubby was already working here; that kind of thing can catch up with you! Thanks again for stopping by, & enjoy your yoga. Definitely on the mend now, and getting to spend more time working! (i.e., making messes). Thanks, Gisele! Great space and I’m a huge lover of texture. Glad you found someone to help with your pain, take care of yourself. Thanks so much for coming by, and for the kind wishes! 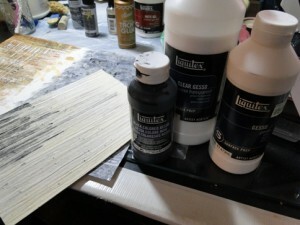 Now I’ll head right over to your blog – what a fun project this is! I’m sorry that recovery from your injury has been so slow and painful. I’m sure “take frequent breaks” is good advice for us all. Tabatha, thanks so much for coming over! I feel for your pain. I’m glad you were lucky enough to find someone to help get you back in shape. I think your desk looks surprisingly organized, especially since you have such limited time working in it. I also hope to see those projects you are working on now when they are finished. I can remember when some of the big box home improvement stores gave samples of that paper away. Sadly, that’s not the case anymore. Thanks so much for clicking over! I loved “visiting” your studio. Appreciate the kind wishes, too. And – I remember loving to pour over those sample books growing up. Didn’t know I’d be tracking them down to buy and use many years later! So sorry about all of this, so happy that you’ve made progress. It must be so frustrating, Robyn. And in the midst of it, you’re still creating fabulous art. I’m happy to see what you’re doing, & of course, wish you improvement every day! Linda – thanks so much; you’ve always brought on the encouragement and positive energy. I’m starting to feel better every day – seeing light for sure. I appreciate your stopping in! Great to discover your blog through Seth’s project! Thanks for coming by. Not so messy….but then your working time is restricted. Hope you are soon well enough to really get stuck into it. WOW! The project you are sharing here looks FABULOUS! 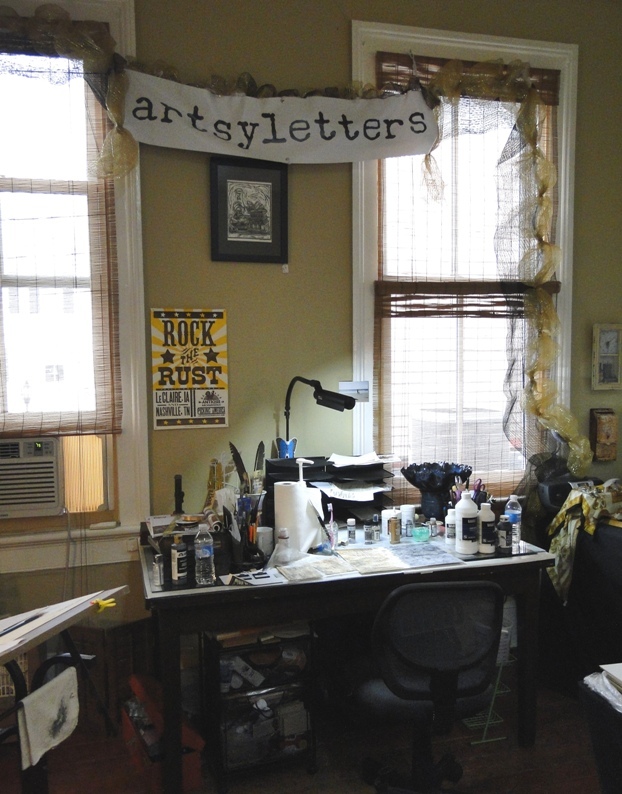 And I like the studio table with your banner draped over it – very cool! Thanks for stopping my own ‘studio table’ – I’m off to check out your other studio link now! Those papers are gorgeous, Robyn. I can’t wait to see what you create with them.